Anyone involved in the education system, from students to teachers to administration, faces challenges both in their own lives and at school. Up the Down Staircase, by Bel Kaufman and dramatized by Christopher Sergel, is a story about some of those struggles. Hillsboro High School will be performing it this weekend. “The story is about first year teacher, Sylvia Barrett, who has big dreams and ideas of what it will be like to be an English teacher and to instill a love of writing into her students. Working in a New York City public school, she finds that the life that is going on with students and what her ideas are, well, she is going to have to execute things a little differently than she expected,” said Director Leah Rose. “It’s a great story. It’s about real stuff. 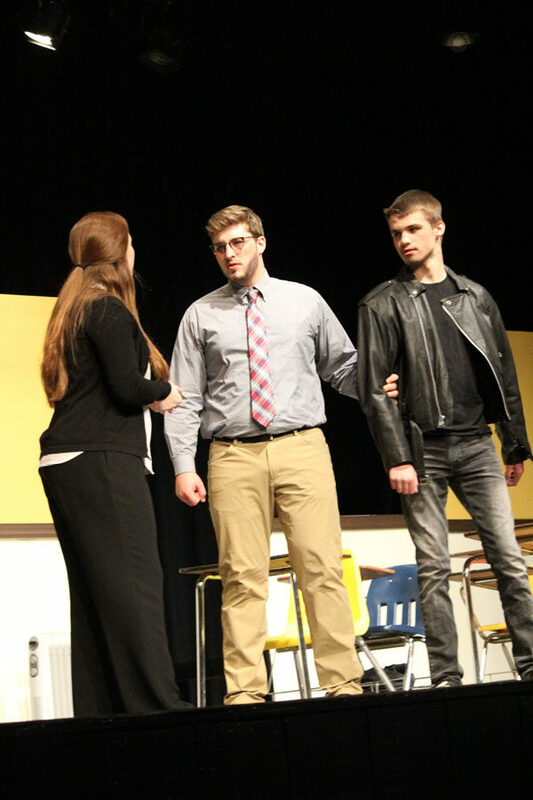 All of these students have their own stories behind the main story,” said sophomore Bryce Rader who plays troubled student Joe Ferone. The cast of consists of 24 students with lead roles played by Callie Arnold, Kayla Gunn, Sarah Paulus, Tucker Moss and Rader. It is directed by Rose along with Assistant Director Tricia Williamson. The cast stars many players who have been in productions their entire high school career. “I’m going to miss working with Leah. She’s a great director. I’m excited to start college level. I can’t wait to take all of my experience at high school and apply it to college,” said senior Gunn. The directors do want to put a word of caution out to parents that, due to some of the subjects addressed, this show is not ideal for younger audiences of elementary school age and younger. If you have questions, you can email (see below) or call the school and ask to speak to Leah Rose. This play could trigger some emotions for adults that they may not be prepared for, but topics are addressed well. The shows are at 7 p.m. on March 22 and 23 at the HMHS Auditorium. Tickets are $5 each. You can order online by email at playticketsales@usd410.net or show up and pay at the door. The show is just under two hours with intermission.